Backpacking Guatemala is a lot of fun, and there are so many awesome places to visit. 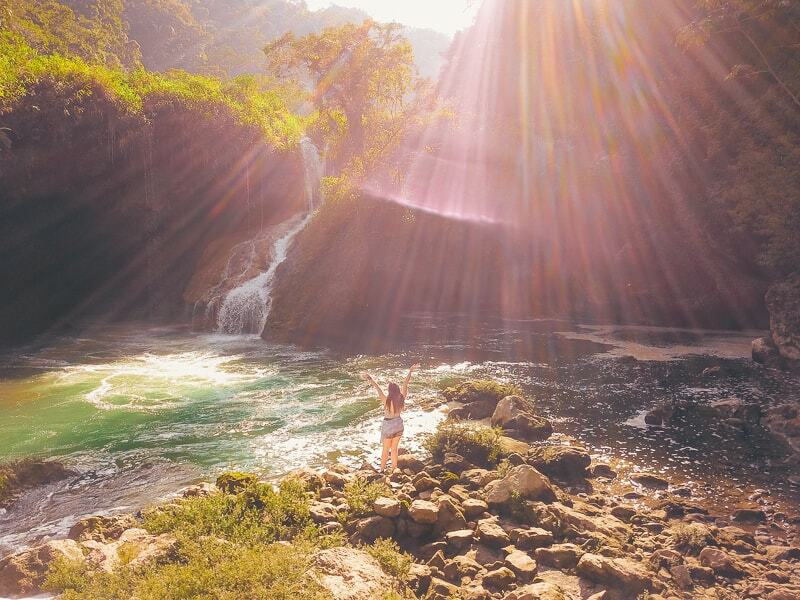 Here's a rundown of what we got up to, as well as some ideal Guatemala itineraries. As a part of our 3 month journey backpacking through Central America in 2019, Guatemala was one of the countries we were most excited to visit! It is home to some of the world’s largest and best preserved Mayan ruins, as well as endless, untouched jungle. What we loved so much was that Guatemala is not yet crowded out by tourists, making it easily one of the best backpacking destinations in Central America. In coming years, there’s always a chance this will change, but at the moment, it still maintains it’s natural charm. They still rely heavily on old dusty roads and pick up trucks to transport tourists around popular sites. I loved the rugged, natural feel of the country and the warm, good-natured friendliness of the locals. All around our three week backpacking trip in Guatemala, we found the locals to be nothing short of welcoming to us and happy to have us exploring their gorgeous country. And in turn, hopefully we can help showcase to you what you can expect to see and do in Guatemala, if you plan to go backpacking there this year. So sit back, relax and get ready to delve into our in-depth backpacking Guatemala guide. The currency used is the Guatemalan Quetzal. We tried using dollars a few times and were refused, but there are plenty of exchanges in popular cities. It is customary to tip 10% in Guatemala and many places will automatically add this onto the bill. In our experience, there isn’t a massive party atmosphere in Guatemala. Of course, you can find tonnes of places to get drunk in cities and popular backpacking spots, but they’re not known for big clubs. Antigua was the best place we found for partying. Christianity is by far the dominant religion in Guatemala. Many also descend directly from Mayan populations and still follow traditions from that time. Many more practice a unique blend of Christianity and Mayan beliefs. The ATM’s in Guatemala are quite famous for being highly unpredictable. One day they will work fine, and the next you will struggle to find a single one within a city that works (a problem we had in Flores). Almost all are yellow and have “5B” on them; they also charge a small fee for withdrawals. I recommend withdrawing large amounts in one go, just in case they suddenly stop working or run out of money. We used Revolut and Monzo throughout Guatemala. If you are staying below 1500m, then there tends to be little risk of malaria throughout the year. But there is always a chance and the risk varies depending on region. We recommend taking antimalarials with you just to be sure. Especially if you are backpacking throughout other parts of Central America as well. The majority of Guatemalans speak Spanish, and around 40% speak English. Many also speak a wide variety of ancient Mayan languages, but these differ depending on region. Guatemala uses Type A and Type B power sockets. So American appliances are fine anywhere. There are a few companies offering sim cards with good coverage across Guatemala. These are Tigo, Claro and Movistar. You can pick these up cheap throughout the country, just be sure to take your passport when purchasing. You should make sure you have coverage for Hepatitis A, Hepatitis B, Typhoid, Yellow Fever and Rabies. You may also need other jabs, so speak to your travel doctor before visiting Guatemala. At the time of our visit to Central America in early 2019, there is a lot of concern about the safety in a number of countries in the region. In our experience, Guatemala was incredibly safe and there is an abundance of tourist friendly hotel and transport options available throughout the country. Just be sure to maintain basic safety best practices; such as not going out drunk late at night and keeping money stashed away. Up until around 900AD, it was the Mayan people who dominated this region and built the incredible pyramids and other structures you can still find there today. The Mayans continued to live in the area for several hundred years more up until the Spanish Conquest in the 16th Century. From that time onwards, the Spanish held heavy influence over the region and you can still see this today in the language, religion and design of their cities. They gained official independence from the Spanish in 1821. There are dozens of cities and towns to visit all across Guatemala, but only certain ones are geared towards tourists. So below I’ll take you through the 4 most popular spots to visit on a Guatemala backpacking itinerary. In each of these, you will find plenty of accommodation, places to eat and things to do, as well as other backpackers. I recommend spending at least 3 or 4 nights in each one if you really want to see everything and enjoy your time in Guatemala. Tikal is easily one of the most popular places to visit in Guatemala. This is because it’s the largest Mayan site anywhere in the country. There are a few places to stay in Tikal itself, but it’s a little out of the way so not that many people choose to do this. Instead, the beautiful island of Flores (Isla de Flores) is the perfect place to stay as it has excellent transport links and a great range of accommodation for all budgets. Plus, the island itself really is stunning and you’ll find loads of bars and restaurants offering cheap food and drink that take full advantage of the views on offer. You will find other things to do in and around Flores as well, so it’s worth spending at least 3 nights here. Many people actually fly into Guatemala and arrive at the Mundo Maya International Airport, located a 10 minute drive from Flores. 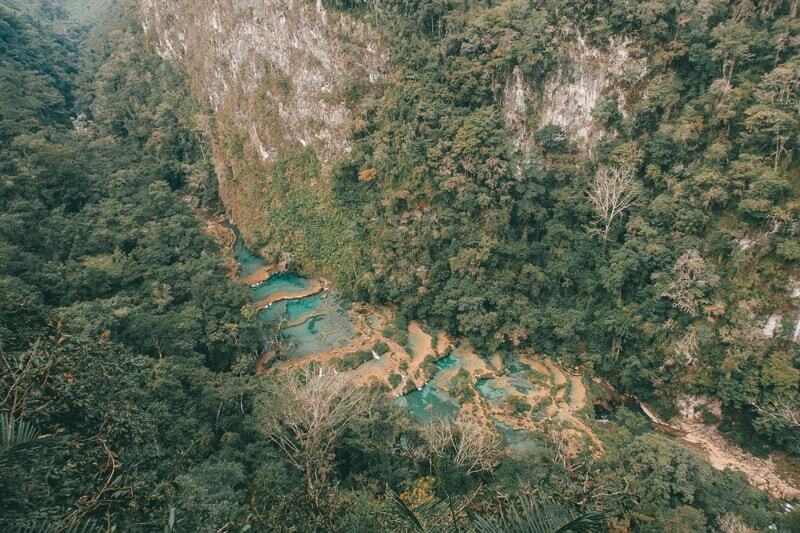 Perhaps the most beautiful place in Guatemala is Semuc Champey. This spot has garnered incredible popularity in recent years because it houses some of the most beautiful natural pools anywhere in the world. I can back this up as, even across Asia where there seems to be a waterfall every other day, Seumc Champey really is impressive. Once again, it is possible to stay in or near Semuc Champey itself; however, most choose to stay about 40 minutes away in a town called Lanquin. Here, you will find a lot more accommodation options, as it is where all tourist buses drop you if you wish to visit Semuc Champey. We chose to stay in Lanquin and went on a day tour to Semuc Champey. All hostels/resorts offer a shuttle service down to Semuc Champey each day, just be prepared to ride in the back of a cattle truck! 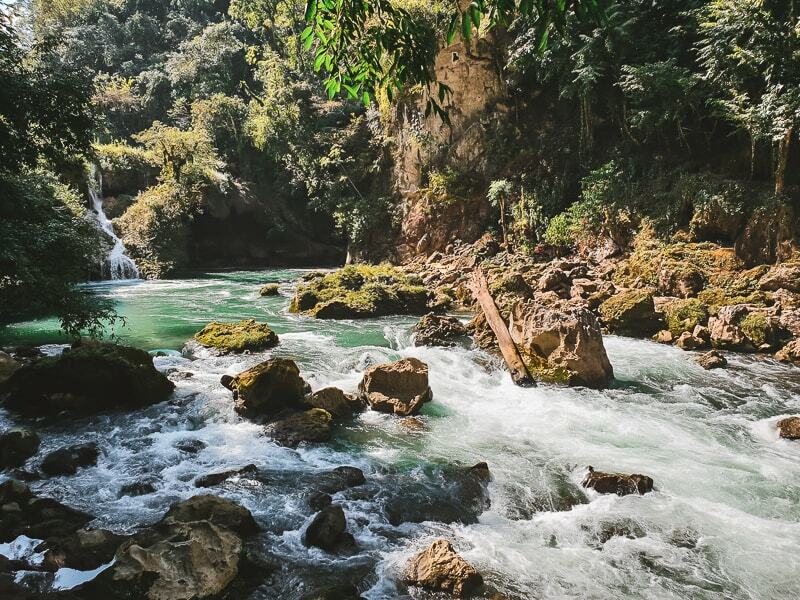 Read Also: Visiting Semuc Champey (Guatemala) : Everything You Need To Know! Not to be confused with the Caribbean island, the city of Antigua lies just over an hour away from Guatemala's capital city (Guatemala City). In fact, Antigua actually used to be Guatemala’s capital city, until 1773 when much of the town was destroyed by an earthquake. The government wanted the capital moved to a safer location, not surprising as the city literally lies in a bowl, surrounded by volcanoes! Despite this being a little worrying, as many of the volcanoes are still active, it does have a number of unique benefits. First off, it’s possible to climb up many of the volcanoes on day or evening trips from Antigua. And secondly, past eruptions have helped to make the land in and around Antigua incredibly fertile. As such, it is the perfect place to grow coffee! So while you’re here, we recommend going on a coffee tour to one of the nearby coffee farms. The city itself is really impressive as it’s in typical colonial style with cobbled streets running throughout. It is very modern and clean and you’ll find tonnes of nice restaurants, cafes and bars located all throughout town. Antigua attracts all kinds of tourists, right through from budget backpackers to wealthy families looking for a wonderful getaway. I ended up spending my birthday here so had a great time partying it up on the same night as the Super Bowl. 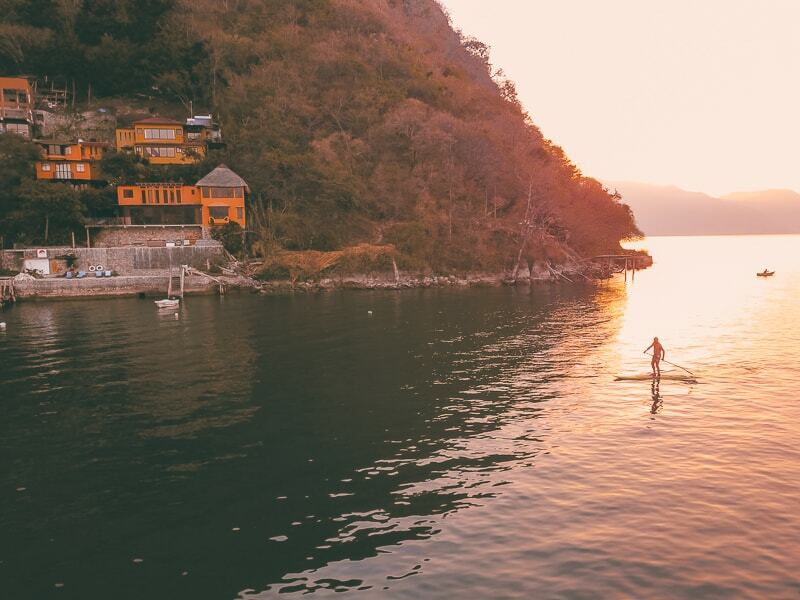 Easily the most peaceful place to visit in Guatemala is Lake Atitlan. This is a massive 130 km squared lake located about 1500 metres above sea level. All around the lake there are small towns and neighbourhoods that can be reached either by car or boat. Here, you’ll find hostels and hotels to die for, with the best ones being located right on the water’s edge. We stayed for a few nights in a guest house right on the lake, and every morning awoke to incredible views of the blue water outside the window. 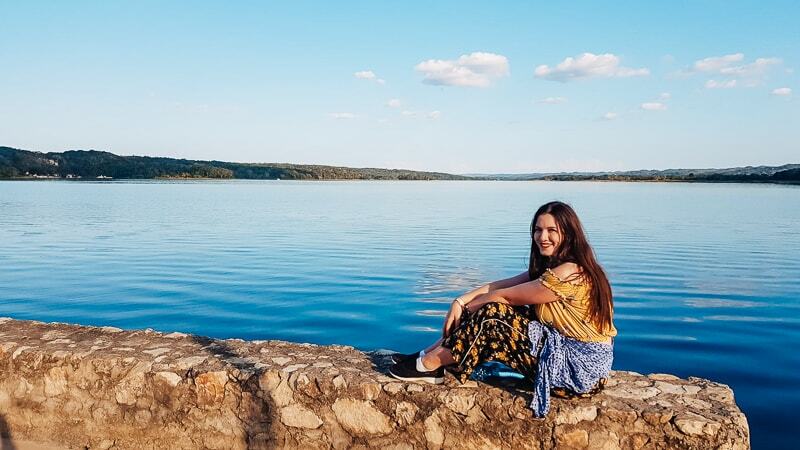 There’s a few things to do around the lake, such as hiking up surrounding volcanoes or going paddle boarding; but in my opinion, it’s nice to just take some time to relax and unwind. Backpacking through Guatemala can get a little tiring as every day you seem to find yourself going on a new tour to Mayan ruins, hiking a mountain or discovering a coffee farm. And, though all of that is so much fun, you need to take time to relax and enjoy your time in the country. 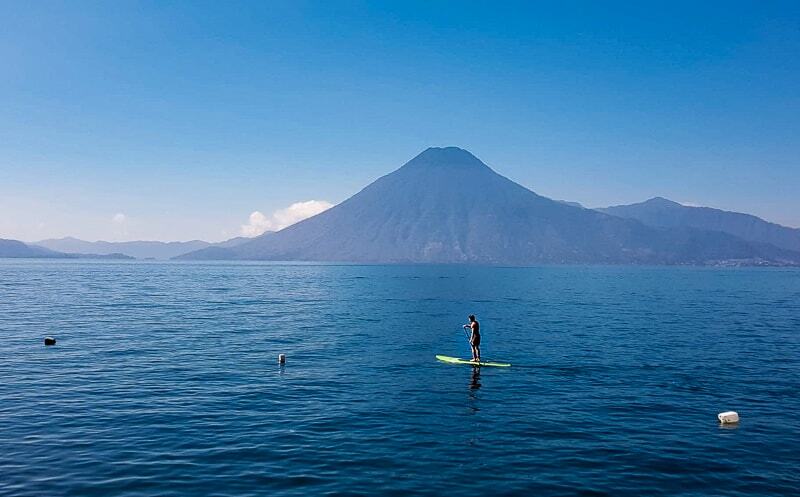 Well, there really is no better spot to do exactly this than at Lake Atitlan. 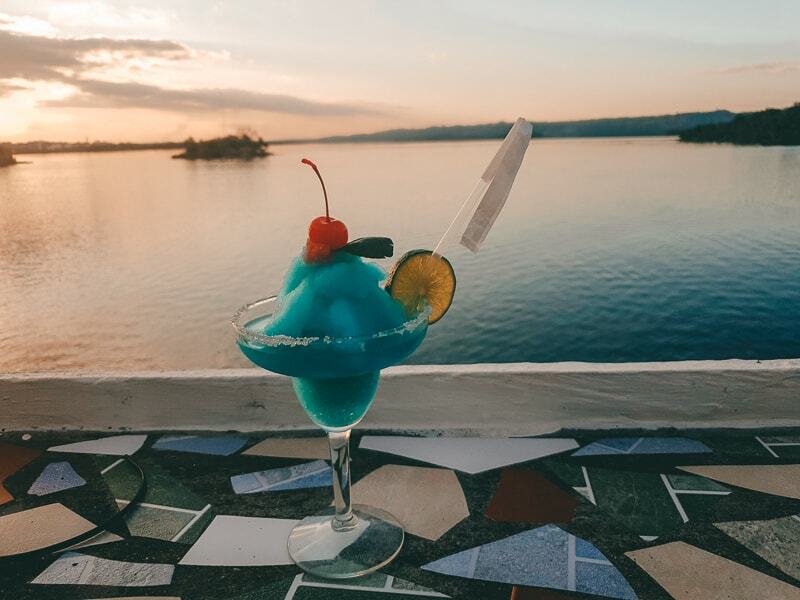 Though it might not sound like a lot of stops, the 4 places listed above will allow you to experience all of the things for which Guatemala is most famous; including it’s Mayan ruins, volcanoes and coffee plantations. Getting between each stop can take up to 12 hours, so once you factor in travel and a few nights in each one, that is already two to three weeks gone. Quetzaltenango - If you want to visit Santa Maria volcano, then Quetzaltenango (or Xela) is a very popular place to stay. Also, though it is the second biggest city in Guatemala, it is widely loved because of its charm and diverse cultural feel. Guatemala City - As the capital city, it is much more built up and modernized than other parts of the country. By many accounts, it is also less safe and not overly popular amongst backpackers. Todos Santos Cuchumatan - Here, you will get to discover Guatemalans wearing traditional clothing every day and living lives that are more inline with their ancestors. They are particularly famous for their incredible celebrations of the annual All Saints Day. Livingston - Located on the Cairbbean coast, the only way to get here is by boat! It’s popular amongst tourists looking to learn and experience traditional Guatemalan culture, complete with typical food, drinks and dancing. Chichicastenango - Located about 3 hours north west of Guatemala City, Chichicastenango is popular due to its variety of open air markets where you can pick up Mayan-made crafts. There are so many cool and exciting things to do in Guatemala that planning the perfect itinerary can seem daunting at first. However, with a handy route of shuttles and buses running throughout the country, it's actually pretty straightforward to make it to most of the best Guatemala attractions. So if you’re wondering what to do in Guatemala and don’t want to miss out on anything, then all of the following things to see and do can be covered by visiting the 4 major cities/towns listed above. This is arguably the number 1 thing to do when backpacking through Guatemala. 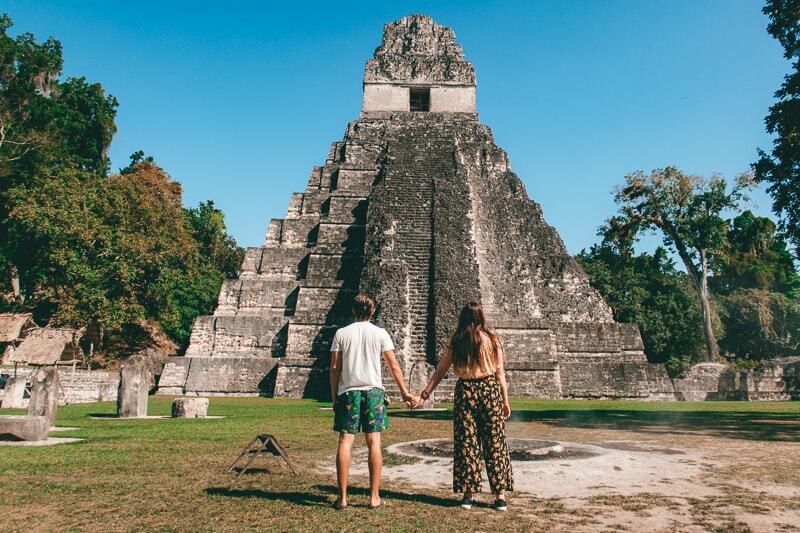 Discovering Mayan ruins is an exciting thing to do across Central America and if you’ve already been to Mexico, then there’s a good chance you've discovered some ruins already. However, this does not mean you should avoid Tikal. Instead, Tikal is widely considered the biggest and best preserved Mayan site in Central America. In fact, it is so well preserved in its natural state that it is estimated around 3000 temples in the area have not yet even been discovered! 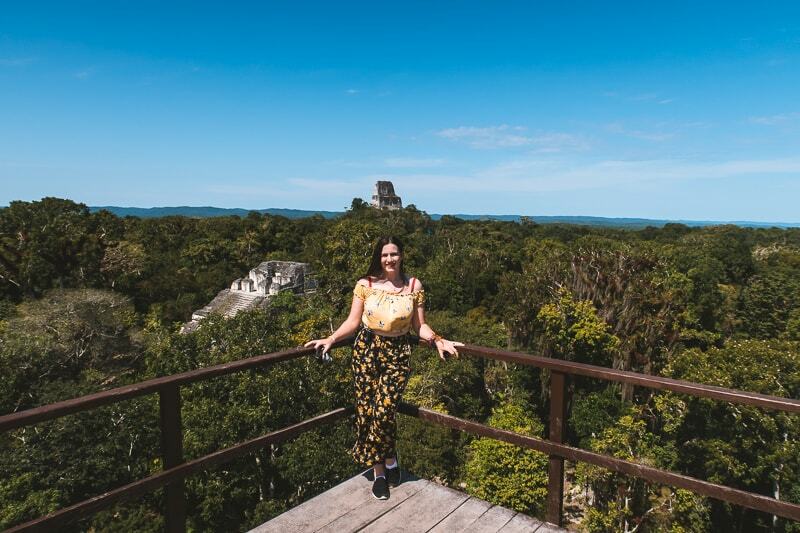 When here, you have the chance to climb to the top of a few of the tallest temples in Tikal, and the views really are astounding. It is possible to visit without a guide, but I highly recommend you do get one. They offer big guided group tours where you pay just $USD5 extra per person and you join the group. They are very friendly and help to make the experience that much better by taking you through the best route and helping to put the whole complex into historical context. Read Also: Visiting The Tikal Mayan Ruins: Everything You Need To Know! Another one of the best tourist sites in Guatemala is Lake Atitlan. This vast open lake is almost like a paradise on earth, nestled perfectly between volcanoes, just a couple hours drive from Antigua. I highly recommend you pay a little extra and stay somewhere right on the shores of the Lake, like we did. That way, you get quick and easy access to the lake whenever you like. In particular, in the early morning, before all of the boats start running! Depending on the time of year, you will have at least 2 hours where the lake has very little traffic and you can jump on a paddle board and take yourself out. The lake is so calm and still and, as soon as you get even slightly away from shore, it feels like it is just you and this vast expanse of open water. I could spend ages here talking about all of the different volcano hikes in Guatemala, but there really are so many. If you are visiting places like Lake Atitlan and Antigua, you will find plenty of volcanoes to explore. This is because the Western side of Guatemala lies on a massive strip of volcanoes that runs all the way further down into El Salvador and Nicaragua. Make sure you book onto a tour before visiting a volcano, as they can be a little dangerous and hard to navigate. In fact, whilst we were in Guatemala in early 2019, one unfortunate British backpacker died up on a mountain near Lake Atitlan. But do not let this put you off! As long as you go on a guided tour, you should be absolutely fine! Some of the best volcano hikes can be found in Antigua, one being a 3 hour hike up where you then get to roast marshmallows in the heat coming out the side! Another allows you to hike and sleep overnight on the volcano so as to enjoy a breathtaking sunrise the next day. 4. Enjoy cheap cocktails and great food! All across Guatemala, one of the things we loved most was the cheap food and drink to be found everywhere! Much of it is typical Mexican-style food, like tacos and fajitas, but that doesn’t bother me! You can also find plenty more freshly made dishes, in particular chicken, beef and fish. You'll also find cheap beers and cocktails in most mid-range restaurants. We typically paid between $USD1 & $USD2 for a margherita, and less than $1USD for a beer. If you want traditional Guatemalan food, then it is based largely of the staple diet of the Mayans. This means you get to eat plenty of corn based foods, as well as beans. Breakfast in Guatemala tends to be quite nice and a typical meal will include eggs, plantain, beans, tortillas and possibly pico de gallo. Whilst on the subject of food and drink, it’s worth mentioning that Guatemalan coffee is awesome! If you are a big fan of coffee, then you will not be left down by the coffee selection available across the country. This is because they actually grow the beans in the country and there are a number of farms that are trusted and used by big chain coffee brands all around the world. To learn more about what makes Guatemalan coffee so special and how the process of making coffee works, I recommend heading out on a coffee tour. We went on a tour of La Azotea farm, located about a 15 minute drive from the city centre. If you book at a local tour agency in town, then they will end up ripping you off to get to any one of the farms. Instead, you’re best off just doing what we did and going direct. You can get an uber for about $USD5 each way or, even cheaper still, get the local chicken bus. I would definitely recommend La Azotea as the guys doing the tours are incredibly friendly. Also, as a part of your entrance fee they also give you a quick tour of their on-site museum of Guatemalan music. It’s very interesting and another great way to learn about the culture of the locals and how it has evolved since Mayan times. Visiting Semuc Champey was one of the highlights of our time in Guatemala. Here you will discover a number of outdoor pools, many of which you can swim in. We ended up staying here with a group of friends for almost 2 hours, as the pools were simply too enticing to leave. You can jump in, dive in and, as you venture down through them, you even come across a natural rock slide! Just be sure to take your camera and ideally a GoPro with you as well. It’s the ideal place to pick up some travel photos and Instagram shots to make your friends back home jealous! Out of all the cities we visited in Central America, Antigua had to be my favourite. It feels like you’ve stepped right into Europe, as the streets are all lined with cobblestones and the buildings all have that low, colonial design. What I like a lot about Antigua is that it has everything you’d expect a modern city to have. Including tonnes of restaurants, bars, museums and shops. However, they don’t all stand out in the same way you’d expect to find in other cities around the world. Instead, in Antigua they are all sorts of hidden and blend in as all the buildings maintain the same style and design. Another thing Guatemala is well known for is offering incredible sunset opportunities. Some of my favourite moments from our time spent backpacking Guatemala come from the evening as we were enjoying a drink, watching the sun starts to go down. It’s a wonderful time of day and is oftentimes a relief if it’s been a particularly hot day! As well as discovering Mayan temples and ruins, another great thing about Guatemala is the chance it offers to learn more about Mayan culture and the way they lived. They were, at one time, one of the most advanced and dominant civilizations on our planet, so have had an incredibly large influence over modern day Central America. And if you are genuinely interested in learning more about these people, then Guatemala is a great place to do it. The coffee tour we went on in Antigua offered up some interesting insight into the lives of the Mayans through their music tour. But ultimately, the best way to learn more is to simply take time speaking to local people living in Guatemala. Many of them are incredibly proud of their Mayan ancestry and are all too happy to tell you more and educate you. Many still speak some form of ancient Mayan language and have beliefs that cross over into both Chritianity and the Mayans. As well as making great coffee, the Guatemalans really do know how to make great chocolate. And it’s no surprise seeing as Guatemala is where chocolate first originated! In fact, the modern word “cacao” actually comes from the Mayan word “Ka’kau”. For centuries though, chocolate was not eaten in the way it is today, but was insetad used as a drink. Prior to coffee becoming a popular Guatemalan drink, it was cacao that people used to drink. After coffee became popular, it took a large number of years before chocolate started being made and combined with sugar so as to remove much of the bitter aftertaste cocoa has. To learn more about this and to sample the wonderful chocolate that Guatemala produces, you can visit chocolate museums located in different parts of the country. Once again, Antigua is home to some of the best chocolate museums, such as ChocoMuseo. Full disclosure: we didn’t get to do this in Guatemala, but I really wish we did! The problem is, very few people promote it online. As such, it is probably one of the most underrated, yet best things to do in Guatemala! I only found out about the option to do a Mayan jungle trek after visiting Tikal, and would certainly return one day to do it. From what I have learned, the 5 day jungle treks start from near Tikal, and you walk for two days deep into the jungle until you come to El Mirador. This is a “new” Mayan site that has only recently been discovered and which many scientists believe is actually bigger than Tikal! However, because it has not yet been truly uncovered, there are very few tourists here so is much more rural. After you arrive, you get to spend a day there before taking a different 2 day walk back. On the route through the jungle, you also come across a number of other Mayan sites, most of which very rarely get seen. I talk about this 5 day trek in more detail in my guide on the best things to do in Flores. If you are planning on spending a lot of time travelling through Central America (and possibly South America as well), then doing some Spanish lessons could be well worth your while! When in Antigua, we met a Canadian couple who were living there for 6 weeks, with the main purpose being to learn Spanish! There are a number of different packages in places like Antigua where you pay a fixed sum every week and you then get 4 or 5 hours of Spanish lessons every single day. This is a much faster and more effective way of picking up Spanish. Then, you're set for the rest of your time backpacking through Guatemala and further afield! Plus, it’s a great way to kill some time if you are wondering what to do in Guatemala and have a few weeks spare! 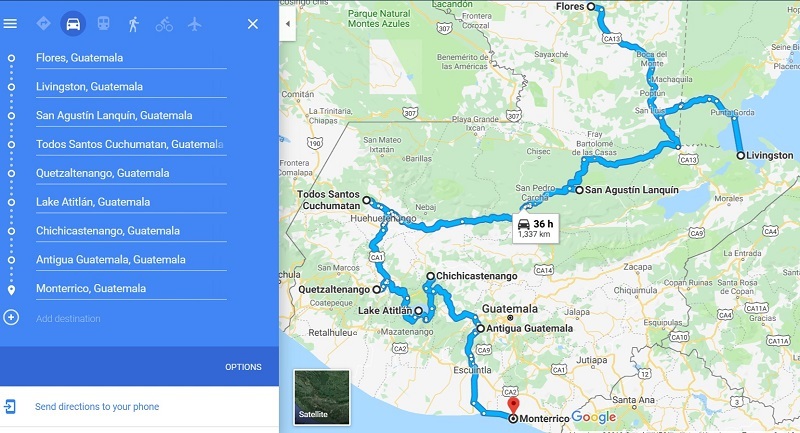 As you can see from the places listed above, you really don’t need to visit many different towns and cities in Guatemala in order to see everything you need. As such, I recommend basing yourself in each of the 4 main places discussed above and using those as bases to explore everything in the area. There are tour operators that can help you out in all of the places mentioned above, and operate tours as short as one day and anywhere up to a few days and more. 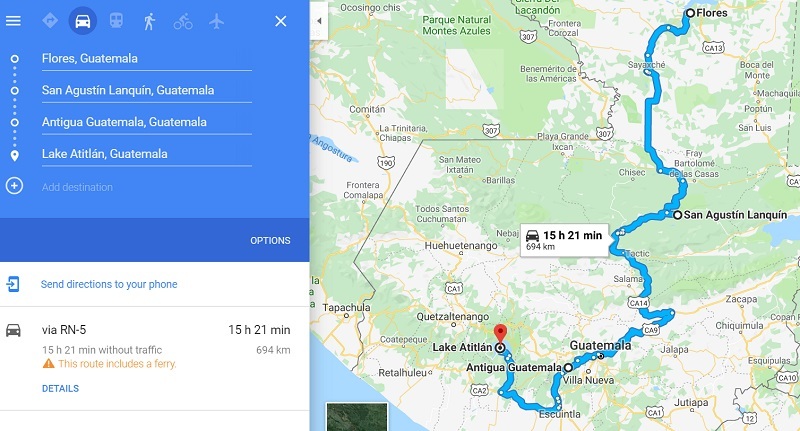 Depending on your time, here is a quick rundown on what I think are the ideal Guatemala itinerary routes look like. If you’ve only got 1 week to spare in Guatemala, then you might not have the chance to do all 4 places, as you will lose at least a full day just on minibus transfers. So it’s best to decide what it is you are looking for from your time in Guatemala when picking your 1 week travel route. Here are a couple of sample itineraries to choose from. If it were me, I would be tempted to opt for the second one. 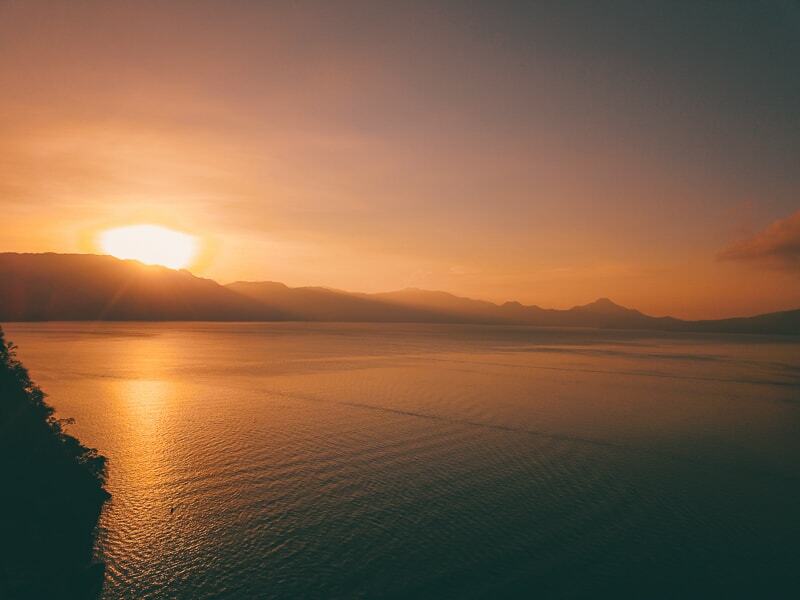 Then, if you were really keen to see Lake Atitlan, it’s possible to do a quick overnight tour there, giving you a few hours in each of the days to see the Lake and explore. Below is the route we followed! We actually spent 4 weeks backpacking Guatemala in total, but that’s only because we had time to kill before our flight back north, so decided to spend 10 days living in a place called San Lucas Sacatepéquez, which is located between Antigua and Guatemala City. It’s a lovely spot, but we were there mainly just to work, so there’s not too much else going on! If you’ve got 3 weeks in Guatemala, or even 4 weeks in Guatemala, then you should be able to fit almost all of the best places into your backpacking guatemala route. Here is such an itinerary that would allow you to squeeze absolutely everything in. Another great thing about this country is that there is no one best time to go to Guatemala. The climate tends to be very hospitable all year round and they don’t suffer from the sorts of monsoons that plague Asian countries like Vietnam. But though it’s called the “wet season”, it’s not exactly raining buckets. Instead, the majority of the rain will be contained to a 2 hour period each day, giving you plenty of time to explore whichever area you are in. We visited in January and February, and I can confirm that the weather during this time is great! It’s not so hot that you can barely walk around without needing to go inside, and the nights aren’t cold. Also, at this time of year, the country wasn’t very busy so we had no trouble finding cheap accommodation. From what we read online, Guatemala tends to be busiest in the months of January and February. However, we didn’t find this to be a problem at all! Although, saying that, there seems to have been a general durntown in tourism to many Central American countries in the last couple years, so it’s hard to say what things will be like for sure in coming years. Which areas are you planning on visiting? 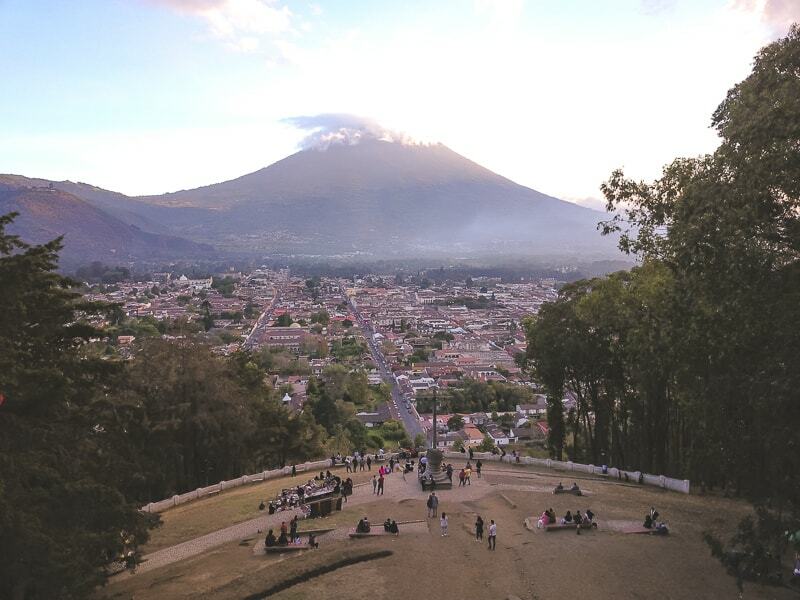 The temperatures and climate can vary quite a bit depending on which part of Guatemala you are in. For example, Flores and Tikal tend to be at least a few degrees warmer everyday than Antigua and Lake Atitlan. The latter of which rarely exceed 25 degrees Celsius at any time of the year. And throughout the months of June, July and August, the difference can be as much as 6 or 7 degrees. 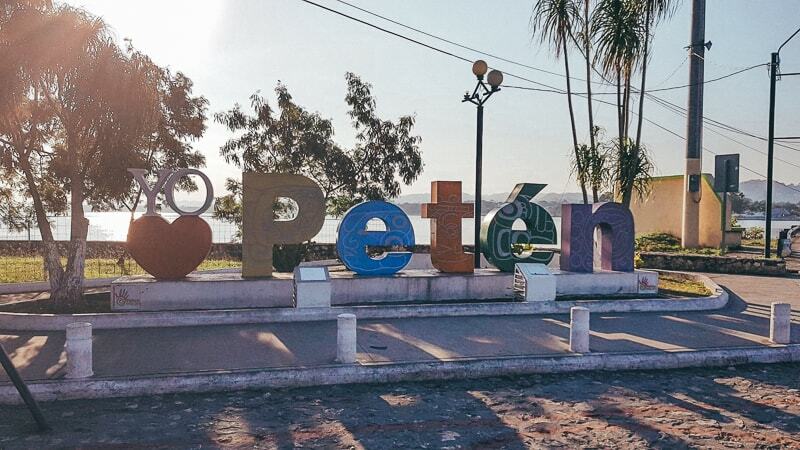 Where else will you be visiting in Central America? Instead of basing your trip around what the weather 's like in Guatemala, you also want to consider which other nearby countries you plan on visiting. For example, Belize is good for things like snorkelling at certain times of the year, so you might want to base your schedule around that. Alternatively, you might instead be planning to make it to Nicaragua in time to catch some awesome surf! So think about how well your travel plans in Guatemala fit in with other countries you will be heading to before and after. For more information on planning the best time of year to visit Guatemala, here is a useful guide. When it comes to sorting your Guatemala visa, you’ll be happy to hear, it’s not all too complicated. First things first, you need to be aware of the C4-4 Visa Agreement between the countries of Central America; including Honduras, Guatemala, Nicagura and El Salvador. This agreement allows certain tourists to travel within any of these countries, visa free, for up to 90 days (3 months). Be aware that this does NOT mean 90 days in EACH country; it means 90 days across all 4 countries. You can extend up to an extra 30 days upon payment of a fee and any overstaying will result in fines as usual. The C4-4 agreement applies to: those in the European Union, Canada, Australia, Israel, New Zealand, Japan and Switzerland. If you’re outside those countries, please check with your government travel website for further information. Also bear in mind that your passport needs to have at least 3 months validity. You should have some form of onward travel proof, but we were never asked at land borders; and honestly, the land borders are pretty lax. Travelling to Guatemala from USA: United States citizens traveling to Guatemala will need a U.S. passport valid for at least six months past their intended length of stay. A ticket documenting onward or return travel is also needed. U.S. citizens can stay in Guatemala for up to 90 days without a visa. If you are crossing via land borders there is no entry or exit fee and if someone asks you for one, you should ask for the official paperwork. They will most likely conveniently forget about that fee. It’s illegal. If you fly out of Guatemala, there is a $30 exit fee, but this is usually included in your airline ticket. So, basically, there is no cost to visit Guatemala! How Do You Get To Guatemala? You have a few different methods of getting to Guatemala, each one suiting different budgets. To get to Guatemala, we took a bus that ran from Palenque (Mexico) to Flores. We booked a Mexico to Guatemala bus with a company in Palenque, of which there are a lot. It cost us 600 pesos per person and included a transfer by minibus from Palenque to the border and then a different minibus from just over the border, all the way to Flores. The process of crossing over at the border can be a bit slow, solely because of the Mexican authorities. Once you get into Guatemala, it is incredibly slack. So much so that we had no idea where the Guatemalan border control office even was! We could have simply walked straight through and gone about our day, had it not been for a local who pointed us in the direction of the office. Perhaps the quickest way to get into Guatemala is to fly in. They have a number of airports around the country, with Guatemala City being the biggest and most popular. Some people choose to fly into the Mundo Maya International Airport, located just outside of Flores. However, this all depends on where you're coming from. For example, if you are flying from London, then the only airport you can fly into is Guatemala City. If you want to find cheap flights to Guatemala, then I recommend using Skyscanner. Top Tip: When doing the search, set the destination as “Guatemala (Any)”. That way, you can see which airports are available to fly to from your departure airport. In some cases, you might find that getting to Guatemala by boat is the most practical option! This certainly isn’t something we did, but I know it’s possible to make it to Livingston by boat from Belize. For more information on this, here’s a useful post. For backpackers, by far the best way of getting around Guatemala is to take minibus transfers. 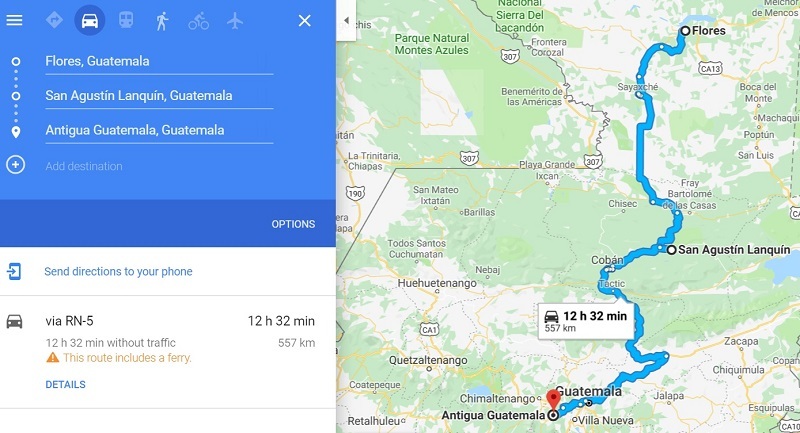 There are a number of companies that offer daily transfers between all of Guatemala’s most popular destinations, and they are all pretty cheap. Here are some answers to the most popular questions about getting around Guatemala? How do you purchase transfers in Guatemala? One is just to head to the various tour agencies located all around town. You will find tour operators everywhere, and they all tend to offer very similar prices. They don’t own the buses, but instead take a commission on the sale. I recommend you speak to a few different companies before booking, just in case they are trying to rip you off. Oftentimes, you will find that your hostel or hotel actually offers a better price than the tour operator, so it’s worth asking how much they charge. This can also save you a lot of hassle, rather than heading round town speaking to different companies. A lot of the time, the cheapest way to buy transfers is on the buses themselves, as you are on your way to one destination. This happened as we arrived in Lanquin, where someone actually got on the bus from the company and was then selling onward tickets from Lanquin. It turns out that there are only 2 or 3 companies that run from Lanquin, and by selling direct to you, you get to cut out the middleman. That way, you get a cheaper rate and they get more of the ticket price. You can also better guarantee that the ticket itself is legit, and to ask them any questions you have. I would avoid this at all costs. We spoke to a guy who did exactly this and ended up paying about 3 or 4 times the actual going rate for a ticket! If you are there in peak season, then perhaps the peace of mind from buying online is good. But for when we travelled in January/February, this was completely unnecessary! Can you save money by purchasing multiple transfers at once? We did this in Flores, and purchased our trip to Tikal, as well as our transfer to Lanquin and our transfer from Lanquin to Antigua. We figured that by purchasing altogether, we could get a better bulk deal. However, it turns out that if we had just purchased them all individually from each location, then it would have been slightly cheaper. The other benefit being that you then have more flexibility over when you travel. If you purchase all in one go, then you might be limited to one set date. Another issue we had was that we had to contact the actual bus operator on Whatsapp so as to confirm each ticket before we went, and this ended up being a lot of hassle. As long as you are not heading in peak season, I think you will be completely fine just booking each transfer as and when you need it, at least a day or two before. How much does it cost per transfer? I can’t give you an up to date price on every single transfer, but I can say this … they are all real cheap! Don’t worry, you’re not going to get ripped off, as long as you ask a few vendors before making your purchase. The cost of the shuttle bus from Palenque to Flores is around 600 Mexican Pesos. This seems to be the going rate, and equates to around $30. Buses leave at two different times in the morning and the later bus is actually a little cheaper but takes an extra few hours. There are a LOT of travel agents to choose from but we used “Tulum Travels” and had no problems, so I recommend them. Flores to Lanquin is a cheap trip and you will have a lot of choice when it comes to travel agents. We paid 100Q, but you can actually get it as low as 75Q, so just shop around the town. The debate is whether you should pre book your shuttle from Lanquin to Antigua in Flores (which we did, and there is nothing wrong with doing that! ), or you can wait until you’re in Lanquin and book there. Shuttles from Lanquin to Antigua will cost around 80-100Q and it’s an all-day trip! Getting from Antigua to Lake Atitlan is super easy and fuss free. You could get an Uber if you wish, but the easier way to get there is via one of the many shuttles that leave Antigua to the lake area. They are all pretty much a standard price of $10 and they leave as early as 6.30 am all the way to 4pm, so you’ve got flexibility. You don’t need to book your return until you get there. Again plenty of options! 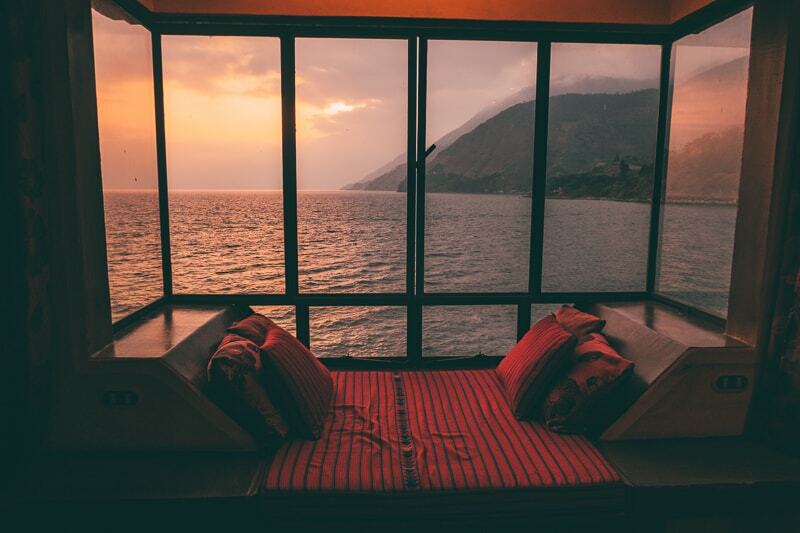 If you’re heading to El Salvador, then you can get a shuttle from Lake Atitlan. But it will make a stop at Antigua to transfer you onto another shuttle bus. It’s not the worst journey in the world and we paid 250Q which was around $32. This was a lot cheaper than some tour agencies were offering, so my advice is to choose a tour agency that is not located on the main strip of Panajachel. If you are travelling down north from Mexico, then all the way to Antigua, you will find that roads are either dirt track, or covered with speed bumps. This is annoying because it limits how fast the vehicles can go, and also means that for hour after hour you are going over speed bumps. That being said, we never found roads in Guatemala to be dangerous. It’s hard for the drivers to speed and drive recklessly, which is always nice! What other ways are there of getting around Guatemala? I suppose it’s possible to take some internal flights within the country. After doing some research online, I can see that it’s possible to fly between Guatemala City and Flores. But do be aware that, though the flight will only take about 45 minutes, this is expensive. Apparently, a number of carriers are working to try and increase the availability of domestic flights within Guatemala, but I’m not sure when this will change. Other than this, you could always go ahead and book private taxis between different destinations. If money isn’t a problem, then taking a private taxi between places like Lanquin and Antigua would certainly be a little quicker and more comfortable. I'm not sure how much this would cost, but it’s best to ask around once you are in your destination. If your plan is to go from Antigua to Guatemala City (or vice versa), then I recommend using Uber. We used them and they are only marginally more expensive than a transfer and a lot faster. We had nothing but good experiences using Uber to get around Antigua and to get to the airport in Guatemala City. In coming years, hopefully Uber will become available in more locations across the country, but it is a country limited. The other option you have is to use the local chicken buses wherever you can. 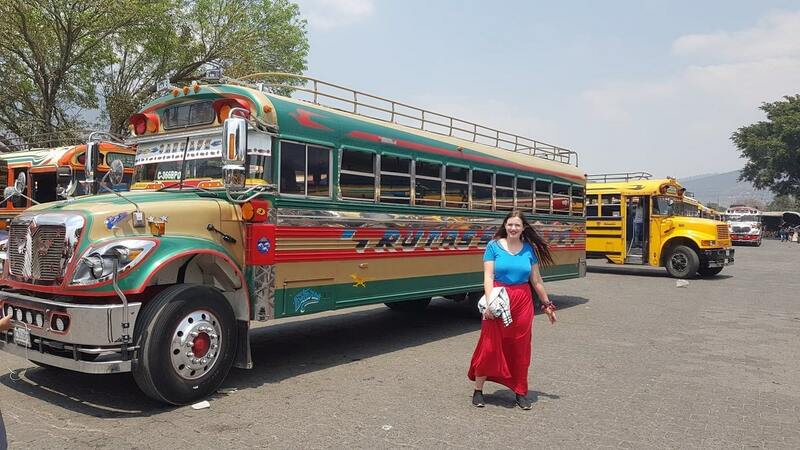 It’s hard to miss the local buses as they are large American school buses that have been converted for use by Guatemalan locals. They tend to be brightly painted as well, so are really quite cool. They are also incredibly cheap! When you board, you pay a fixed price (normally around 5 Quetzales) to go as far along that given route as you like. They also run with incredible frequency, and can show up every 10 or 15 minutes for most journeys. For help knowing which bus to take, just ask your hotel/hostel owner or any local nearby, we found that locals are always more than happy to help! Are you concerned about knowing where to stay in Guatemala? Well, if you are visiting the main destinations discussed throughout this post, then you’ll have no problem finding awesome accommodation all across Guatemala. Every destination has a nice range of hostels, resorts and hotels. So regardless of whether you 're a budget backpackers, luxury traveller or somewhere in between (like us), then you’ll be able to find something. But what is the number one way of finding the best places to stay in Guatemala? We use Booking.com all around the world and they were responsible for 95% of the bookings we made when backpacking Guatemala. Bonus tip: If you are not yet a member of Booking.com, then you can sign up through this link here and get 10% off your first booking! Another great thing about Guatemala is the country doesn’t have any strict dress code requirements. When you visit many Asian countries, such as Thailand, they have quite strict requirements on how you dress in certain places. In Guatemala, this isn’t so much of an issue. Instead, if you are wondering what to wear in Guatemala, then you should just be sensible with the area you are going to. In peak summer months like June and July, areas such as Flores and Lanquin can get very hot, so shorts and t-shirt or dresses will be your best bet. If you are heading to areas like Antigua, then in the winter months it can get a little colder and you may need a hoodie and jeans some nights. But really, the climate in Guatemala is pretty warm most of the year around. So as to make sure you have everything you need, we’ve gone ahead and compiled a list of what to take to Guatemala. Of course, this doesn’t include everything, but does include many of the most important items you’ll need! As a part of this Guatemala packing list, we’ve also included links to where you can purchase them on Amazon. If you do purchase through any of these links, then we receive a small commission. But at no added expense to you! A decent rucksack is essential. Especially if you plan on backpacking for at least a few months. I bought my Osprey rucksack more than 3 years ago and it’s still in perfect condition, despite a LOT of abuse! As such, I highly recommend picking yourself up an Osprey bag. They have all kinds of sizes. 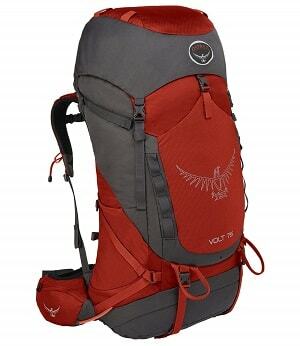 For standard backpacking, their medium size bag will give you plenty of room! For most of your backpacking throughout Guatemala, a pair of comfy trainers will suit you down to the ground. They are perfect for city sightseeing, chilling around your hostel or climbing up volcanoes. 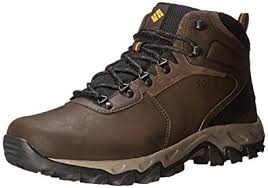 If you plan on doing lots of more adventurous climbing, which there is certainly chance for in Guatemala, then it’s worth taking some hiking shoes. We never used ours in Guatemala, but if you are planning on backpacking the rest of Central America, then there will certainly be plenty of opportunities to use them. I’m a huge fan of Reef flip flops and would recommend them as the go-to shoe for most of your backpacking. 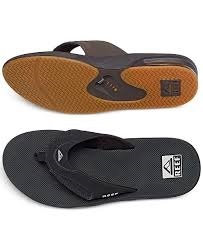 Reef flip flops are sturdier and more comfortable than any other flip flop I’ve worn before and wear them as much as I can whenever the sun is out. Sure, you can pick up a cheap pair for around $USD5 if you want, but they won’t last anywhere near as long or do as good a job. Though Guatemala is hot almost all year round, it can get cold some evenings. Oh, and very wet! 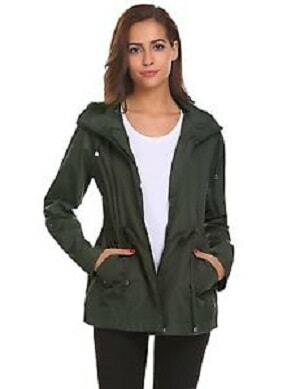 A half-decent waterproof jacket is then pretty useful for all occasions and will get plenty of use on your trip around Guatemala. 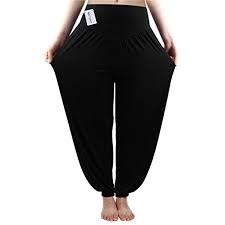 Once again, long trousers are great for cold evenings. I took a single pair of jeans to Guatemala and that did the job perfectly. They’re also a little classier in case you do head out somewhere nice for dinner one evening. 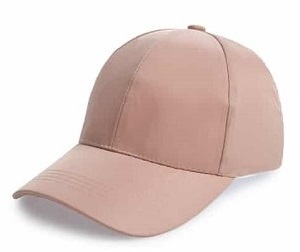 Help keep the worst of the sun off your head with a cap. Pretty self explanatory. Yes, bugs, nats and mosquitos are a thing in Guatemala. They come out in the early evening, once the sun starts going in. As you’d imagine, they are a lot more prevalent in some areas, such as Flores or Lanquin, where there’s more water and jungle around. We took factor 50+ with us, which was more than enough for Guatemala. 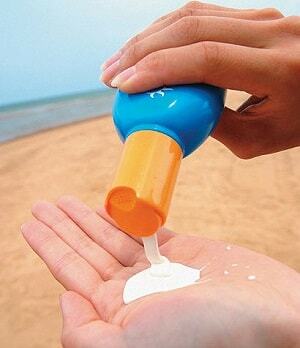 I recommend picking it up before you head out as sun cream tends to be much more expensive abroad than it is back home. If you plan on staying in hotels during your time in Guatemala, then you will receive a complimentary towel in 95%+ of the places you go. But a microfiber towel is still handy for when you're out and about on day trips where you know you’ll be swimming, such as to Semuc Champey. 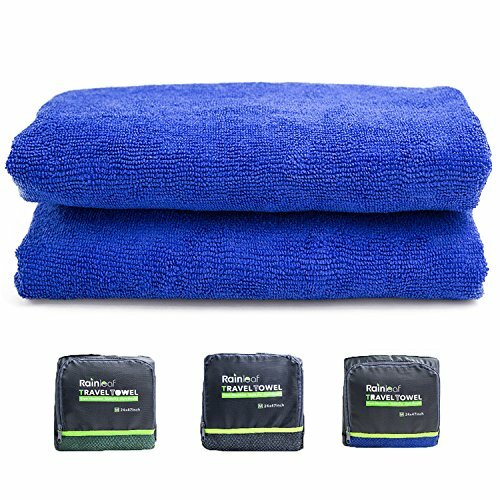 Microfiber towels are small and quick drying, so they’re the perfect backpacking choice. 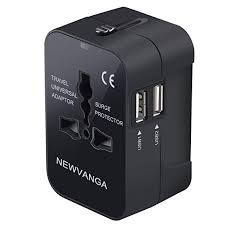 We take 2 of these with us everywhere we go, as it saves needing to worry about which plug sockets each country has. That being said, the standard two-pinned American style plug worked absolutely everywhere we visited in Central America, so an adaptor isn’t necessary if your appliances use this. 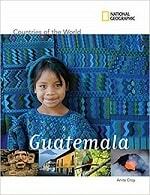 If you’re interested in learning all about Guatemala and making the most of your time there, then you can learn more about this great country with the help of a few books. Here’s just a few different Guatemala guides we came across on our travels. You’ll find plenty of these in many different hostels or hotels, but it’s worthwhile picking them up before you go if you wish to incorporate them into planning your Guatemala backpacking trip. 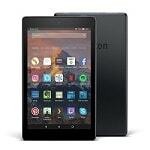 Rather than carrying around a bunch of different looks with you, I recommend instead picking yourself up a Kindle Fire. That way, you can simply purchase eBooks off Amazon and save a whole bunch of room in your rucksack. Or, if you have a decent-sized smartphone, then you can download the free Amazon Kindle app on there and read any eBook directly from that. Good ol Lonely Planet, you see them everywhere! As always, the Guatemala guide is very helpful. 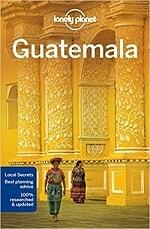 It’s entirely possible to use Lonely Planet for planning backpacking trips all around the world so well worth a read if you are preparing your Guatemala itinerary. In our opinion, Rough Guides actually produce better guides than Lonely Planet. But that’s all down to personal preference. 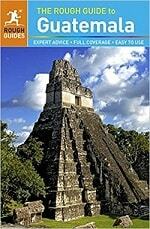 This book is very informative and good for helping you plan what to do in Guatemala and the ideal route for you. If you are interested in learning more about the rich and varied history of Guatemala, then this is a good book to try. This Guatemala history book gives an interesting overview of everything right through from the rule of the Mayans up until the dictatorship of the late 1900s. 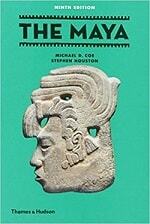 This interesting book looks at the role the Maya played, not just in Guatemala, but also other surrounding Central American nations. So if you are backpacking through other parts of the continent, then this will give you a good overview of the Mayans in general. When it comes to eating and drinking in Guatemala, you are spoilt for choice. Guatemalan food is quite similar to Mexican food in that you've got lots of nachos, enchiladas, quesadillas etc. Breakfast tends to be beans, eggs, fruit and perhaps some form of bread, lunch can be Puspas which is basically a potato based bread stuffed with meat, beans and perhaps cheese. They are regional to El Salvador, but Guatemalans love them too and you can find them anywhere. Dinner will consist of all things Mexican style. However, when you are in towns such as Antigua, you will find a wide range of cuisines from Chinese, american, Italian, vegetarian and many more food options. 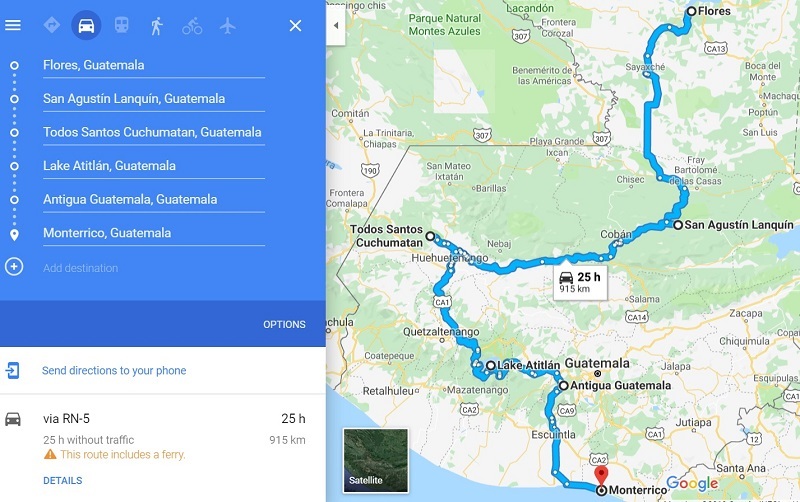 After more than 5 weeks spent travelling Guatemala, we used a whole bunch of useful apps and sites that helped us make our trip a lot better. Whether it was for planning a backpacking trip to Guatemala or to be used whilst out and about discovering each day. So here are some good online tools we recommend you make good use of when backpacking Guatemala. Uber - When you’re in Antigua and Guatemala City, Uber is a great way to save money and get around a lot more easily. At the time of our visit, these are the only places that currently use Uber, but fingers crossed this will change in the coming years! Booking.com - As mentioned above, we used Booking.com for almost all of our accommodation bookings in Guatemala. The app is particularly useful and I recommend you download it before you visit. You can use it to book upcoming trips and also manage existing bookings. It automatically syncs with the website's that, even offline, you can view where you are staying and then it links through to Google Maps to show you where the property is located. Skyscanner - For all of the flights we book (of which there are a lot!) we sue Skyscanner. They have a handy tool that allows you to search by month and see the cheapest combination of dates to fly. Guatemala is easily one of the world’s best budget-friendly, backpacking destinations. It’s very easy to find affordable accommodation, food and transport all over the country, and they don’t overcharge for seeing popular attractions either. If anything, many of Guatemala’s best adventures are slightly underpriced, so it’s easy to save money for any trips you have to upcoming countries that are more expensive. Which, I’m sure you’ll agree is pretty darn cheap. We try to save money wherever possible, by finding great deals. But with that being said, we no longer class ourselves as true “budget” backpackers. In all of the places we stayed we found a private room with aircon, and we tend to eat in places that cost a little more than the real cheap local joints. So with that in mind, I am confident you could backpack Guatemala on as little as $15 to $20 dollars a day if money is really tight. OK, if you are looking to cut back on your cost of backpacking Guatemala, here are some of our top tips. In the “accommodation” section above, I provided links to many of the most popular sites for booking hostels and hotels in Guatemala. Feel free to use a few of these prior to making any booking. Also, make use of the handy features they have, such as Booking.com’s “Sort By Lowest Price” filter. If you like to have a drink or two in the evening, then do your research and find out when happy hour is. Alcohol in Guatemala can be very cheap; you’re looking at around $1 for a beer and $2 for a cocktail, so long as you head out at the right time. Happy Hour times vary depending on location but are usually from 5-9pm in many places. In the most popular locations, you’ll find supermarkets. They stock a good range of groceries, so you can pick up all the food you’ll need to make your own breakfast, lunch and dinner. In many cases, it’s actually so cheap to eat in a local restaurant that it’s hard to warrant the time spent cooking. But, with that being said, you can save a lot of money over a long period of time by picking up cheap pasta and cereal and cooking for yourself or in bulk with friends. Also, alcohol is crazy cheap in Guatemalan supermarkets, so it’s always cheapest just to buy it from there and drink back at your hostel. We spoke to one guy who booked a few different transfers online and got absolutely ripped off! There’s no need to book online, unless you are sure tickets are going to sell out by the time you arrive and have chance to book with a tour operator. In general, most tours we discovered in Guatemala were overpriced because the tour agent is simply a middleman who is making a lot of money on paying to transfer you to a site. Yes, this happens all over the world, but in Guatemala most of the tours we discovered are well overinflated. For example, in Antigua you can go to a tour operator and book a coffee tour for anywhere from $15 to $25 per person. Alternatively, if you just turn up to the coffee farm yourself, then you can join in with a tour no problem and pay the standard entrance fee of about $4 or $5. The transport from Antigua to each coffee farm in just 4 Quetzales if you take the local bus or $5 each way for an Uber. So no matter which way you do it, you save a lot of money arranging things yourself, rather than paying a tour operator. Not only will this give you the option of getting the best prices, it also gives you the best range of accommodation. Yes, many of your bookings will have to be a few days or a week in advance, but you can use Booking.com’s free cancellation policy to book some really cool places well in advance. We try to do this if we find somewhere really nice that we know will sell out. Oftentimes, you will find that the property has free cancellation up until 48 hours before, so you know that if your travel plans change and you won’t make it there by the date of the booking, you can simply cancel. It is expected that you haggle when buying any souvenirs and trinkets in Guatemala. Just like you would in most backpacking destinations. As a rule of thumb, they will typically add on 100-300% of the actual price on top for tourists. Local buses are by far the cheapest way to get around Guatemala. They tend to charge a fixed price, regardless of how far along a route you tend to travel. That price is oftentimes less than a dollar, so use them wherever you can! Yet another reason why we loved Guatemala is that their drone laws are very relaxed! Especially when you compare it to other countries nearby (*cough* Nicaragua *cough*) who have some of the strictest laws anywhere in the world! You are able to fly a drone almost anywhere you wish, just so long as you obey common laws/best practices that all countries have. Such as asking permission first if flying on private land and not flying too close to people’s houses or large groups of people in the open. You don’t need to apply for any special permit, and it’s okay to bring a drone into the country. As always though, I recommend checking up on any recent changes in drone laws before visiting a country. They tend to change quite suddenly in some countries so, even though this was the case when we visited, it might not be anymore. Semuc Champey - If you wish to fly a drone here, then don’t do it in the main park. Instead, head back out and walk down to the waterfall on the other side of the lake and then fly it from there. You can find more details about this on my Semuc Champey post here. Above Antigua - We took the drone up to Cruz de Ferro and flew it from here. You will find a local guard there at most times and we asked them and they said it’s completely fine. 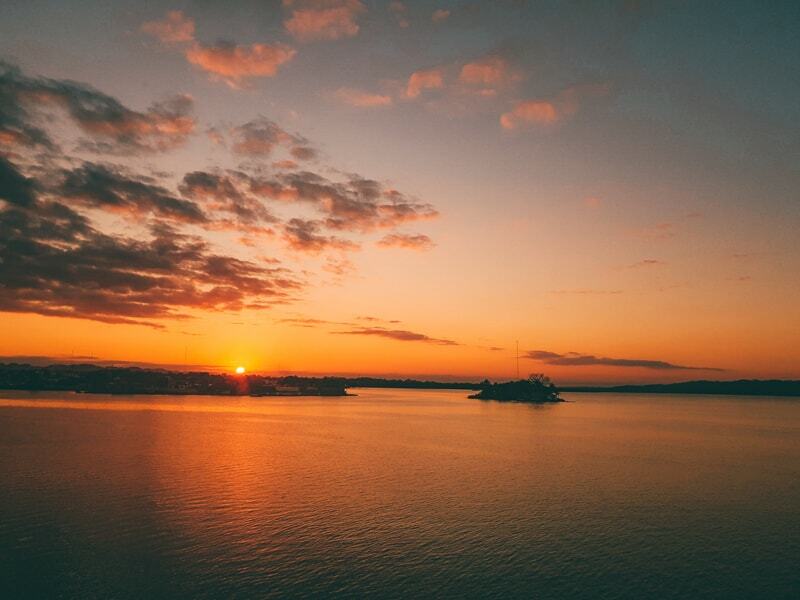 It allows you to capture some really cool shots of the sunset, and also of all the surrounding volcanoes. On Lake Atitlan - When we visited, the weather here was very calm and the sky was a wonderful blue colour. As such, we captured some really cool footage of the boats, of our waterside property and of me on a paddleboard! P.S. If you don’t have a drone yet, then we have the Mavic Pro. It really is an awesome drone and, even though it’s quite pricey, you really do get a fantastic piece of kit for what you pay. Another great drone to buy is the newer Mavic 2, or for something slightly smaller and a little cheaper, then I recommend the Mavic Air. We honestly loved Guatemala and think it’s one of the best backpacking destinations still on offer. It’s not yet been made too touristy and you have plenty of opportunity to discover what it’s like for locals today in Guatemala. Planning an itinerary is also pretty straightforward, as all of the best sites can be reached from 4 or 5 major cities/towns. Also, getting throughout the country is pretty easy, making Guatemala a great destination for solo travellers as well. Throughout this guide, we’ve tried to provide as much detailed support we can, from our time in Guatemala. If you have any other questions, then just leave a comment below and we will help in any way we can!